Interesting, not surprising, and disheartening. [sigh] I'm always looking for hope, though. So, can we change this? what about kids who grow up with the paper at the kitchen table? Can they -- will they?? -- change things, give us real news the next gen will value? From what I could infer from this post (and a quick gloss of the Pew research), "newspapers" refer to the physical, print product. Internet sources, then, could readily include the digital editions of newspapers. Which is as much as to say that, methodologically, news surveys that cite "online" or "Internet" as a source are becoming increasingly less useful as proportionally this number continues to rise. Such a methodology conflates different mediums with different organizational sources. So if I consume (as I do) only digitally-rendered stories from the New York Times and Guardian, I'm - in my mind, erroneously - placed in the bucket of "lost newspaper readers." I do not share the sentiment expressed by Diane and like-minded individuals who find a decrease in printed newspaper readership "disheartening." If fewer trees are cut down to serve my information consumption needs, so much the better. That newspapers tend to produce "real news" may be the case, but that is again conflating the medium with the actual information delivered. Not only is reasonable to envision a future where laptops rather than broadsheets populate a kitchen table, but for countless households it has already arrived. The challenge is in finding models by which high-quality, journalistically-sound news analogous to the best traditional print journalism can be produced in the digital realm. Nostalgic hand-wringing over the post-paper world won't change the fact that the post-paper world is precisely where every known indicator shows we're heading. The solution is to improve the quality of digitally-delivered news, not to continue harvesting trees. So if this is the case, why is it still legislated that legal notices be published in print? Fewer people read it. It costs 10 times as much as placing notices on line. There is way more functionality on line. Our tax dollars don't need to subsidize print newspapers. None of this is a surprise, and I have to respectfully say that the high value placed on good news reporting, is placed higher by those that report it than those that consume it. Newspapers were/are popular because of the packaging and convenience delivery, not because of the high quality of the information. The price of convenience was worth it a while back. Today, news and information is conveniently delivered to digital receivers. And the price of that convenience seems to be worth it today. Frankly, if there is a surprise in any of this, it’s that anyone would still feel there is a “back” to come back to. Readership/consumer habits are not on a pendulum moving back and forth, they are on a fluid track moving on, possibly never to return. So instead of waiting for things to come back to where they were at one time, those that care should be anticipating where they are going to be in the future. The cost (and return) of operating in that fashion is different than what it used to be, but the newspaper industry is not creating the rules. My non-news-following 39-year-old son has long said that if the news in question was something he truly needed to know, it would get to him somehow. He seems to be doing all right in the world, much to the distress of this Chicago-trained newsosaur. I wonder if most young people are aware of just how much of the content they think they are getting from other sources actually originates in the newspaper. Many people rely on aggregated lists for their news and don't necessarily realize that the story was first put online by a local newspaper. I think NYT's David Carr demonstrates it best in his infamous panel stunt where he cut out all the Gawker headlines that came from traditional print sources. The reason Legal ads still need to go in print is because print is a permanent record while online can be changed in 100 ways and disapear at any moment. Once a legal ad is in print in a newspaper it will be archieved forever with and without subsequent changes. Heck, half the things I find on google searches does not even have a date on it. Interesting article and another pointer to the changing delivery options for today's news. Attracting younger readers to print versions of Newspapers will always be a challenge, particularly when their attention is being sought by so many other media sources. Some UK newspapers have done a good job of transferring to the Web, some have not. Falling into the 'Over 40' survey bracket, I would agree with some of the survey results, however where I used to take a daily newspaper, I now only have a Saturday paper (Telegraph) as they were just piling up unread & went straight to recycling! With so much online news and automatic newsletters, daily news is better delivered online. We do still have two weekly local newspapers delivered and that is an area where the 'web' still seems unable to truly compete with local newspapers at the moment. No degree of blogs/forums/local websites etc. can deliver those small stories about local Fete's, Church activities, Flower shows etc. in one place as can a print version of a local Newspaper even if the local Newspaper does have a website which of course does have to be visited. Talking to my two 'under 40's' sons about the survey, both said that they felt that the print newspapers were old technology and anything that they want to know about is online if they need it. Sad, but a sign of the times I feel. There's another question to ask. Not where younger people get their info on politics, local government, etc. but whether they care at all about these issues, regardless of the source. My experience with 20-somethings is that they simply do not care, nor do they pay attention to, local issues, nor all that much about national ones -- if their turnout in elections (minus the blip in 2008) can serve as a guide. For newspaper organizations, overshadowing the issue of where young people get their information is the issue of "how are we going to continue paying the folks who gather and present this information"? Print newspapers support themselves with advertising dollars. How will online publications earn sufficient revenue to stay alive? Online ads don't begin to bring in enough money - and besides you can place online ads on other sites than newspaper ones. 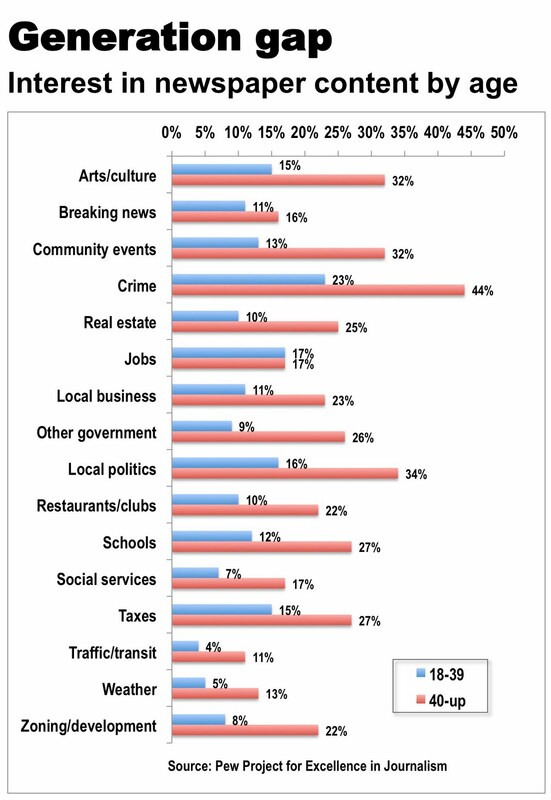 Newspapers need readers/viewers to attract advertisers - but it seems they need more than that. Aren't there some creative ways to make combinations of print and online ads really work for advertisers? Is anyone really working on this? To me, an online news article is still a newspaper. The "paper" has simply become virtual. To me, an online article is still newspaper. The "paper" the words are printed on has simply become virtual. 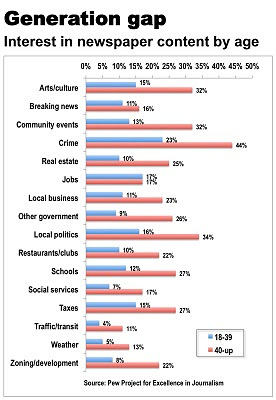 Demand for articles and information has never been higher, most people are just getting it online. Unfortunately no one does a real good job yet of monetizing the web. People want to throw a display ad up and call it done, but that's a print era model. The web will require new models that take advantage of the full capabilities and interactivity of the medium. Shopping tools. If media doesn't do it, others will. Like the car companies did getting together to build a shopping tool for their product. If newspapers could have done that first, car companies would have bought into the new web advertising, but we waited around until they came up with it on their own and don't need us any more. I can point to dozens of missed opportunities like that. It's frustrating because many don't even see how that was indeed their advertising revenue walking out the door. It’s unfortunate to see this because in reality this is sadly not true. If newspapers and television were no longer around, there would be no reporting at all, since almost all journalists work for one or the other. Most of what is written on the Internet begins with one of these entities. Try a simple test, search any major news story from online and it will originate from television or newspapers. If these two sources were gone, we would be left with bloggers like Crystal Cox who write whatever they want with no standards.